All transactions are safe and secure with a reliable history in online purchasing behind each of our associates. Buy the Chicka Chicka Yeah! Fogell t-shirt to own Superbad clothing and merchandise. "Chicka chicka yeah!" is a popular quote from the movie Superbad. Fogell says it in his excitement at school after he tells Seth and Evan that he's going to pick up his fake ID during lunch. Seth and Evan then decide to invite Fogell to the party that Jules told Seth about, since Fogell can now score them some booze. Fogell replies, "Sure about the booze," and tells them that they're going to "party, and get crunk, and rock out." 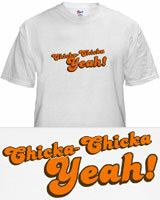 These Superbad tees feature Fogell's "Chicka chicka yeah" quote on the chest. In addition to the Chicka Chicka Yeah! Fogell tee above, browse the Superbad Clothing Gallery for more apparel like men's and women's clothes, kids shirts or hoodies.